Is anyone else so confused by this weather? How can it be sunny one day (and get my hopes up that it’s finally spring) and snowy the next?! I am so ready for spring!! I wore this look for a day of chasing around the kiddos and work meetings! I love a neutral sweater that I can throw on with boots and a beanie to keep me warm on chilly days, and I don’t have to do my hair! If you haven’t noticed I’m such a beanie girl! I just got home from a fun shoot in California for the Rachel Parcell spring Collection which launches on Monday! We are so excited for this release and hope you love the pieces! Have a wonderful weekend and thank you for stopping by! A great and elegant winter outfit with a beautiful sweater! I don’t know what I love more about the look! I think it has to be the bag! Seems so versatile! Winter just doEs not Want to leave yet. Always a beautiful Winter look! ????? Wow, look at all that snow! Seriously so confused. I always think March will be a turning point in the weather and it just keeps bringing in more winter! Right? It is so confusing! Can’t wait for Spring!! 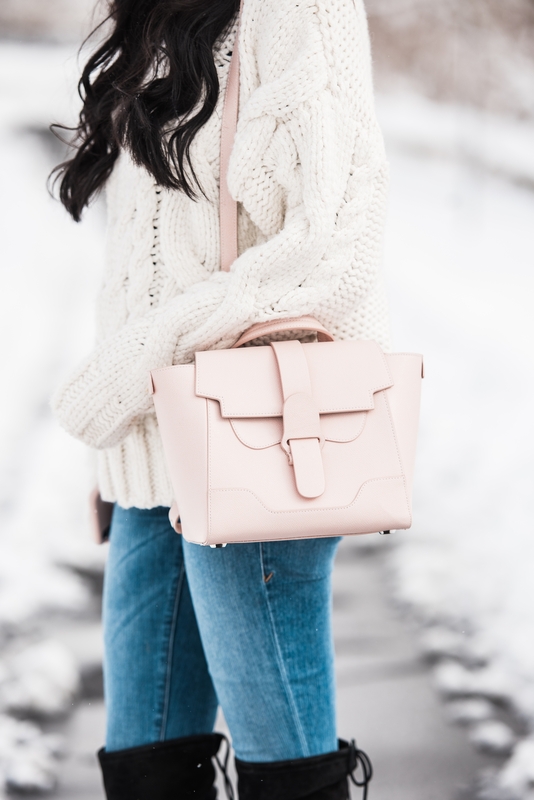 Loving this senreve bag in blush!! Cutest outfit! I love it too! It is the perfect size!! Thank you.. I love those OTK boots! Warm, cozy and super cute outfit! I love the neutral sweater! Looks so warm! I am always such a sucker for white cable knit sweaters! Beautiful!